An employee of the company that actually maintains the machines advised that the pictured suspects are not employees. 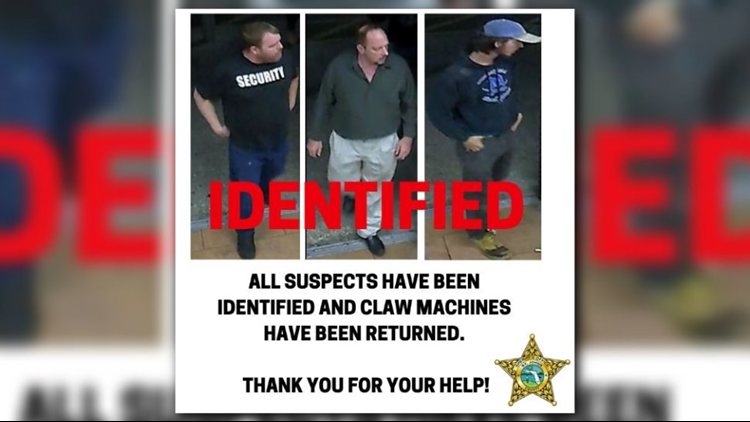 The St. Johns County Sheriff's Office has identified three subjects who they say, stole a claw machine after saying that they were picking it up to repair it. SJSO says that on March 12 the suspects were captured on camera entering the Walmart located on US-1 and taking a claw machine. There, the suspects advised the assistant Manager that they were there to pick up the machine from the property. Deputies say that the men loaded the claw machine into an older white Ford F- 150 and that the subjects also took another related machine from a Walmart in Gainesville. There is no word on what charges they will face.